Early this morning in UK National Elections Underway: Expected Outcome is Hung Parliament I noted the dysfunctional nature of the election. To recap, the expected outcome for the Scottish National Party (SNP) is 51 seats on 4-5% of the vote, while the expected outcome for Nigel Farage's UK Independence Party (UKIP) is one seat on as much as 16% of the vote. UKIP could win 25% of the vote and still potentially not win any seats. I expect UKIP to do a bit better than one seat, but I could easily be wrong. Indeed it is conceivable that not even Farage wins. This morning I said "What matters is how concentrated the votes are, not how many you get." Actually both matter, but concentration is the key to winning seats. SNP is likely to win nearly every Scottish seat because SNP dominates Scotland. It will get no votes elsewhere. Recall the platform of SNP was to break away from the UK. And 51 votes taken away from the Tories (Cameron's party - Conservatives) or Labour (Ed Milliband) is sufficient to result in a hung parliament. The UK The Labour Party is a full member of the Party of European Socialists and Progressive Alliance. They favor taxation as a means to achieve a "major redistribution of wealth and income". Lovely. Had Cameron simply granted UKIP the promised up-down vote on the UK remaining in the EU, the Tories would have had a better outcome. Where is British Politics Headed? Stratfor has a nice writeup today that explains Where British Politics Is Headed. For the second election in a row, the Labour Party and the Conservatives (or “Tories”), the two traditional heavyweights, probably will not muster the 323 seats needed to form a majority government. Whereas in 2010 the Tories were able to form a reasonably stable coalition government with the centrist Liberal Democrats, this time the numbers do not seem to support a two-party coalition. The person most likely to be smiling after the election results are revealed is Nicola Sturgeon, leader of the secessionist Scottish National Party — not just because disorder in Westminster strengthens her party, but also because her party looks set to increase its seat count from six to 53, with pollsters predicting a landslide in Scotland. By contrast, UKIP, another newly influential insurgent party with ambitions to extract the United Kingdom from the European Union, looks set to win just one seat. British elections, like those of many of its former colonies such as India and the United States, runs on a first-past-the-post system, in contrast to the more fashionable proportional voting system preferred by many European nations. Under first past the post, politicians compete for individual seats around the country, and at the end of the vote the party that has won the most total seats is judged to have won the election. Under proportional voting, the electorate votes for their favored party, and when the votes are counted the seats are then apportioned to each party based on how many votes they received. The upshot of the first-past-the-post system is that a niche party is unlikely to win influence in government, since in order to gain sufficient seats it would need to be the dominant party in several constituencies. In a proportional voting system, such a party would find that its presence in government would rise as its popularity increased, even if that support was scattered around the country. It has also frustrated insurgent parties — a famous example being the Social Democrat Party that, in an alliance with the Liberal Democrats in the 1987 elections, managed to amass 22.6 percent of the vote and win just 3 percent of the seats. Herein lies the catch with first past the post: It might keep insurgent parties at bay when they are based on ideology, but it struggles to contain a party that is specifically tied to a region with highly concentrated supporters in the manner of the Scottish National Party. Consequently, the Scottish National Party is positioned to become the third most influential party in the new government with just 4 percent of the overall vote. Meanwhile, UKIP, which is surfing an anti-immigration wave, looks set to find its winnings limited to a handful of seats (at most) off the support of a considerably larger section of the electorate. In its newfound position of influence within Westminster, the Scottish National Party will no doubt set about doing its best to represent Scotland's interests. These include the support of the Barnett Formula, a controversial temporary convention from the 1970s that has been neither reversed nor made into law. The formula calls for more public money being spent on Scotland, Northern Ireland and Wales than on the United Kingdom's English citizens. In 2011, the British public voted against changing the electoral system to alternative vote, in which the voter ranks the candidates in order of preference. This time, six parties are involved, 34 percent of voters are likely to vote for a party outside the main two, coalition talks probably will last much longer than five days, and any deal is likely to result in a weak and unstable government. These conditions are likely to change the thinking about the current British electoral system. Electoral reform will be undertaken, shifting the British system to something more closely resembling its European neighbors'. As a result, the Scottish National Party and other regional parties will find their newfound influence on Westminster to be short-lived. But as one door closes, another opens, and a proportional voting system would usher in new opportunities for UKIP and any future parties built upon a similar model to gain a substantial foothold in British politics. Whatever the case, the future looks increasingly bleak for the United Kingdom's establishment parties. To rein in SNP, the UK may go to a proportional vote. But to do that, UKIP will gain prominence, and likely far more than it would have otherwise. Why? Because many people did not want to "waste their vote" on a party that would get few, if any seats. Then again, if Cameron manages to hold on long enough to grant the promised up-down vote on the UK staying in the EU, and then if that vote is "no" much of the reason for UKIP will go away. Expect an unstable coalition out of this. Cameron staying in power might even depend on UKIP winning a handful of seats more than expected. 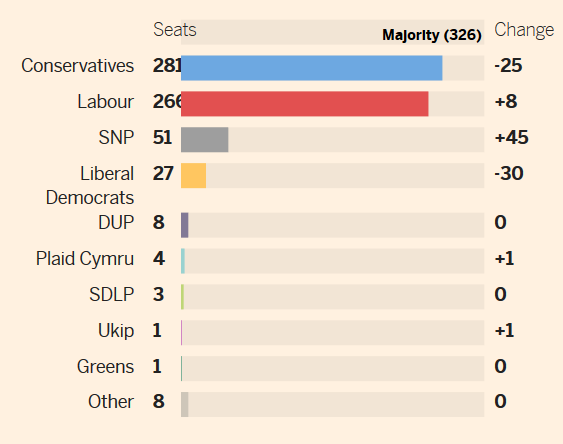 Once again here is the Final Projection from the Financial Times. Note that Labour could merge with SNP and the Liberal Democrats to get a majority. Indeed it is likely that Labour and SNP merge. However, Liberal Democrats are a better fit with the Conservatives. Yet, Conservatives plus Liberal Democrats will not throw them over the top. We will have the results of the election soon. But projections suggest that's when the horse trading really begins. Are there enough horses to go around?